Hooray! Pomegranate season is finally here! I always know winter has arrived when I start seeing those lovely garnet fruits piled high in the produce section. I remember when I ate my first pomegranate as a kid….seated in a chair with a TV tray. It occupied my little hands for hours. (Take note moms & dads!) It’s a great way to keep the kids busy, but watch out for their ruby red stained hands! Pomegranates are super healthy too! Pomegranate’s seeds are the perfect combination of tart and sweet. I love them muddled in cocktails, sprinkled on salads, or even topped on ice cream. The juicy crunch adds an exciting pop of texture! At your next family get together, try my Tender Greens with Tangerine Vinaigrette and Pomegranate Seeds- a delightful twist on a simple salad that will please the whole crowd. And I have a great tip for de-seeding! 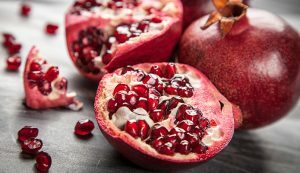 Cut the pomegranate in half and hold one side firmly over a big bowl, with the seeds facing down. Using a wooden spoon, start whacking away! As you hit the back of the pomegranate, the seeds come tumbling out. Talk about a good stress reliever! So pick up some pomegranates and make your winter season DLISH! Ohhh Brussel Sprouts…these cute little cabbages have been pinned with a bad reputation over the years – But luckily for brussel lovers like me- these bite sized morsels have made a resounding comeback and aren’t just making an appearance only at thanksgiving dinner. They are definitely on the total hip list these days, and for a good reason! Not only are they packed full of essential nutrients, they’re super versatile too. We love them roasted, sautéed, shaved raw, or even fried- with walnuts, bacon, bourbon, maple – the combinations are endless. Try my Brussel Sprouts with Toasted Walnut Butter…they are knock-your-socks-off delicious! You can even separate the outer leaves– for different preparation spin. Just simply cut out the core of the Brussel sprout with a small paring knife. Then separate the leaves – sautee them in a hot hot pan – super quick with a little olive oil and garlic – voila! So tasty tossed on your favorite mac and cheese or grilled pork chop. Spread the walnuts on a baking pan and place in the preheated oven for about 5 minutes, or until the nuts are lightly toasted and golden. Let cool. Place the butter, salt, pepper, lemon juice, zest, and maple syrup in a food processor and process until smooth. Add the cooled walnuts, and pulse until the butter mixture is almost smooth but small pieces of walnut are still visible. Steam the Brussels sprouts in a steaming basket over boiling water until just tender but not overcooked. Immediately toss with the softened walnut butter and serve. -If making the walnut butter ahead of time, it can be refrigerated for up to 1 week or frozen for up to 1 month. Be sure to bring to room temperature before using. 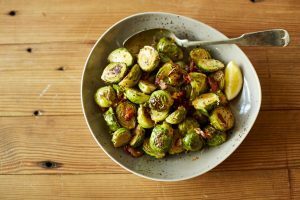 -Another way to serve the Brussels sprouts is to peel each “leaf” off and sauté the leaves in the walnut butter. Purple carrots, orange cauliflower, yellow beets – colorful veggies are popping up in gardens and grocery stores everywhere. Eating the rainbow has never tasted so d’lish! Not only are colorful veggies beautiful, they’re incredibly healthy too, thanks to their naturally occurring pigments. Beta-carotene in yams, lutein in red peppers, lycopene in tomatoes…the list goes on and on! Each color plays a different nutritious role in your body, and packs a powerful punch of flavor. Bright orange sweet potatoes are so good for you and when baked or roasted can starve off sugar cravings. Lime green Romanesco Broccoli is a relative of both broccoli and cauliflower. Originally grown near Rome in the 16th century, it looks like it’s from a sci-fi movie- so the kids will love this one! I like it best when roasted with olive oil and sea salt with a squeeze of fresh lemon. For your next dinner party, pile a serving platter high with fresh, crisp veggies from every color group for a healthy appetizer option. 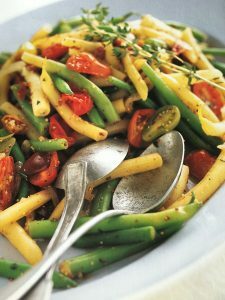 Or how about my Green and Yellow Pole Beans Provencal! It’s the perfect colorful dish to please a crowd. Meanwhile, to the onions in the bowl, add the vinegar, mustard, thyme, and olives, then toss in the beans as soon as they are done. Toss in the salt and pepper; taste and adjust the seasoning as desired.